If the earlier events of Tyndale’s life can only be sketched in outline, the years after his departure from England in late 1523 or early 1524 provide even more of a puzzle. We know that Tyndale came to the conclusion that he could not translate the Scriptures into English in London or even in England itself. Consequently he left his native country, never to return. But where did he go and what did he do in the period before his first attempt to print the New Testament in Cologne, Germany? Some have speculated that he went to the city of Hamburg where he was hosted by a widow, Mrs. Margaret Van Emerson until he went to Cologne. However, J. F. Mozley in his magisterial life of Tyndale has given strong evidence that he first went to Wittenberg where Luther and Melanchthon were teaching. In proof of his thesis, Mozley examined the matriculation registers of the University and found under the date of May 27, 1524 the name, in Latin, Guillelmus Daltici ex Anglia or William Deltici from England. What is the significance of the name William Daltici? Mozley demonstrated that if the syllables, dal and tin, were switched, it would be Tyndal. Mozley’s work is a fine piece of investigation and it would be charming to think of William Tyndale, Martin Luther, and Philip Melanchthon conversing together about the events of the day and the work that God was doing in reforming His church. Doubtless, they would also have conversed about the remaining work to be done including the translation of the Scriptures. If the above is correct, it would give us a clue to where Tyndale learned the Hebrew tongue because we are quite certain that he left England ignorant of the Old Testament source language. It would also give us a clue as to his activities from the time that he departed England. But whether or not such was the case, we can place William Tyndale and William Roye, another English priest, in Cologne later that year. Roye’s name does appear on the matriculation list of Wittenberg University so there does not appear any doubt of his presence there at the same time as Guillelmus Daltici. This would also give us a clue as to where Tyndale and Roye made their acquaintance. Roye was not a linguist but he could prove valuable in reading proof, knowledge of English, and other matters. Tyndale would later remark that he did not have any one to “counterfeit” him. The idea is that he did not have the help of another person skilled in the source language that possessed the ability that he needed. Unfortunately, Roye proved to more of a hindrance than an aide to Tyndale but that will be noted later. At this point we must ask why did Tyndale choose the city of Cologne in which to do his translation. Although the Reformation had occurred in parts of Germany, Cologne by no means had decided wholeheartedly for reform. It was probably due to the number and quality of printers that were resident in the city. Printers were known to turn a blind eye and deaf ear to the material they were asked to print if the profit margin were sufficient. We assume that it must have been sufficient for Peter Quentel because the work of translation and printing began at his workplace. Tyndale and Roye would have been close at hand to aid in the proofreading as the composers and printers probably were ignorant of the English language. Thus the great work of translation of God’s Word into the English language from the original Greek source language began. Evidence points to the use of Erasmus’ third edition of his Greek New Testament as the exemplar from which Tyndale did his translation. 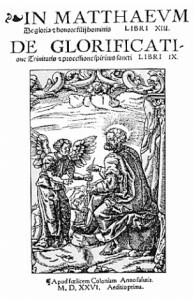 The third edition was published in 1522 and incorporated some minor changes and variants from the Complutensian Polyglot that had finally been published in the same year. Although the printers were undoubtedly ignorant of the English language, they were not reticent in telling what was taking place in Quentel’s shop. We learn that one John Dobneck, also called Cochlaeus, was also in the city. Dobneck was a decided foe of Luther and the Reformation and had written a number of attacks against him. He was undoubtedly a bitter man because he felt he had never been rewarded adequately for his stand against Luther. Perhaps the best insight into his character comes from the alias or nickname that had been assigned to him: the snail. We learn that he had been expelled from Frankfurt and had come to Cologne to see the work of Rupert of Deutz through the press. Rupert had been abbot of a nearby monastery over four hundred years previously but Dobneck believed that his writings were pertinent to the present state of the church. By chance he chose Quentel as his printer. Apparently he overheard the printers when they were under the influence of drink bragging that all England would soon be Lutheran whether or not King Henry VIII approved. They spoke of an English New Testament that was being printed and would soon appear in England. The work was progressing rapidly and they were already printing the book of Mark. Seeing the opportunity to halt the potential Reformation in England and also to gain the favor of Henry VIII, he went to Hermann Rinck, a senator of the city, who was a friend of both the Emperor and the King of England. Rinck initiated an investigation into the matter and it was conclusively shown that Dobneck was correct. In the event, the police were sent to Quentel’s shop to arrest and deport Tyndale and Roye and to destroy what had already been printed. Tyndale and Roye managed to evade the authorities and escaped up the Rhine River to Worms. However, what had been printed was seized and destroyed. There is some difference of opinion as to how far the printing had been done. Dobneck mentioned that Matthew was completed and Mark nearly so. However, the one remaining fragment of this printing that has survived, and known as the Cologne Fragment, contains Matthew chapters one to twenty-two. There is extant only one copy of this initial printing of the New Testament in English and it was only discovered by accident. It is housed in the Grenville Collection in the British Library. 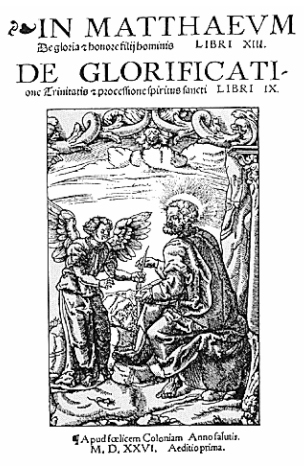 It is in quarto and much of the Prologue is taken from Luther’s Introduction to the New Testament. As a sequel to what occurred in Cologne, Dobneck wrote several letters to King Henry VIII relating how he had intercepted the printing and by implication had prevented England from spiritual disaster. This was done in hopes of receiving a reward from the King for his diligence. In this, as in many other incidents of his life, Dobneck was doomed to disappointment. Although he wrote again, telling the same story and reminding the English king and authorities that he was the savior of England, they took ignored him. Later when Dobneck wrote a very scathing life of Luther, he included his account of the events at Quentel’s printing shop and bewailed the ingratitude of the English authorities. But what of Tyndale and Roye? We noted that they had evaded arrest and made their way up the Rhine River to Worms, the city where five years before Luther had made his stand for the Reformation. In our next narration we will note how that work of Reformation continued with the printing of the first New Testament in the English language.